On Tuesday, Inman published a review of SetSchedule, a data-driven lead generation and sales support company for real estate agents that just launched a mobile app. After the article went live, Inman received two highly critical claims in the comments from readers that SetSchedule was not delivering on its word to users, prompting Inman to look deeper into the product and its founder. It’s not uncommon for some readers to share a negative experience with a technology product, but the criticism regarding the company’s lead quality and customer service — one commenter used the word “fraud” — encouraged Inman to talk to more users about their experience. Inman spoke on the phone to the two original commenters, Jarod Marcus and David LaVallee; as well as two agents selected from SetSchedule’s Facebook page; and one agent who gave the product a four-star review on Yelp. The main concern brought up by these customers to Inman were related to lead quality and customer service. One SetSchedule customer, who was featured in a post on SetSchedule’s Facebook page and asked to remain anonymous, at first told Inman he found the company to be “OK,” saying that he “… can’t say anything bad about them.” He didn’t have much interest in talking to Inman. Barbara Padilla, a Realtor with Berkshire Hathaway Home Services in Rancho Cucamonga, California, last year gave SetSchedule four-stars on Yelp. Inman also spoke with Brian Trainer, an agent with eXp Realty in Rocklin, California. He was also recently featured on SetSchedule’s Facebook page, and signed up for the product in January. Trainer claims that after weeks of leaving voicemails with SetSchedule to address why his leads were so weak, he was told the company does not give refunds. He said he received six new leads immediately after that complaint. Four leads were unaware of why he was calling, according to Trainer. Another lead, “…an older gentleman, I may be able to close because I see him around our small town,” Trainer said. Trainer also says one of his leads called the police on him, believing he was a scam artist. He spoke of several additional rounds of leaving voicemails and company promises to address lead quality. “I’m just going to eat my costs at this point,” he said. The SetSchedule app, reviewed by Inman Tuesday, is very new — it’s been in beta for a year with 12,000 users; it will send invites to 10,000 agents in the coming weeks — and the agents we spoke to were using the company’s lead services, which included phone, email and text messages services, available before the app. Roy Dekel, SetSchedule’s founder, told Inman that the app will be better quality than the legacy system due to new data partnerships the company has in place, and that agents will have more control over the leads they choose to follow-up with. “I’m aware of the problems with the legacy system and am doing all I can to fix it,” Dekel said to Inman in a follow-up call after this article was published. Inman also raised the service and lead quality issues with Dekel in the original interview. The agents Inman spoke to agree that all leads take time to nurture, but at the heart of their collective ire is poor service when inquiring about lead quality. “First off, we’re opening an office in Phoenix, Arizona, that is going to have additional staff members and account executives for onboarding starter and premium members,” Dekel told Inman. The appointment scheduling center is located in the Philippines, Dekel told Inman. The people in that office receive lead data and schedule appointments, but aren’t trained to analyze leads, according to Dekel. SetSchedule also has about 30 customer service employees based in Irvine, California, headquarters, according to Dekel. In terms of lead quality, Dekel ensures the leads sent to agent customers are legitimate homeowners, and that agents have to follow-up. “A lot of homeowners are interested in getting additional information, or home evaluations, or the potential for selling the house above their mortgage. 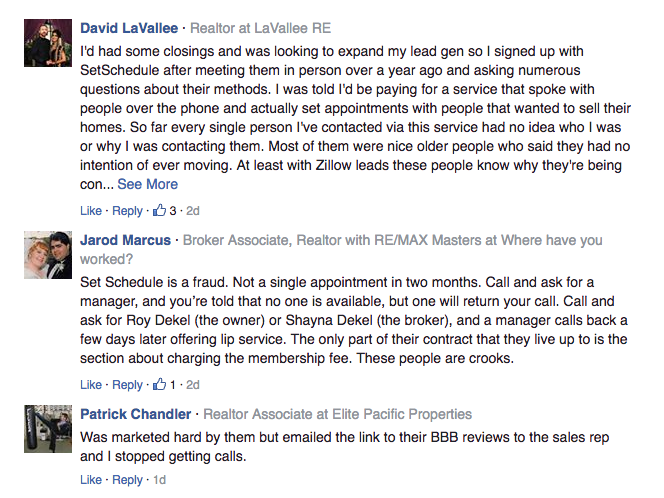 There’s a lot of dynamics, and some of agents are having better experiences than others,” Dekel said. The ruling stated that from 2011 to 2013, Dekel misappropriated $3.29 million of investor funds as CEO of Diverse Financial Corp, of which he owned a 45 percent stake. “It was a civil case that’s been settled and closed, and had nothing to do with SetSchedule or the real estate industry,” Dekel said when asked about the filing. Dekel also noted that the company currently charges 30 percent for referral fees but is dropping it to 20 percent starting the week of April 15. SetSchedule averages four out of five stars on Yelp. Its Facebook page boasts 894,000 likes (high for a small business — or any business, for that matter), while its Twitter account has over 6,300 followers. Inman inquired into whether SetSchedule has ever paid for likes and followers on social media, but Dekel said that none of SetSchedule’s likes on Facebook, or followers on Twitter, are fake. If you have an experience with SetSchedule you’d like to share, email press@inman.com or leave us a note in the comments. Editor’s note: This story has been updated with additional comments from SetSchedule founder Roy Dekel and product user David LaVallee.